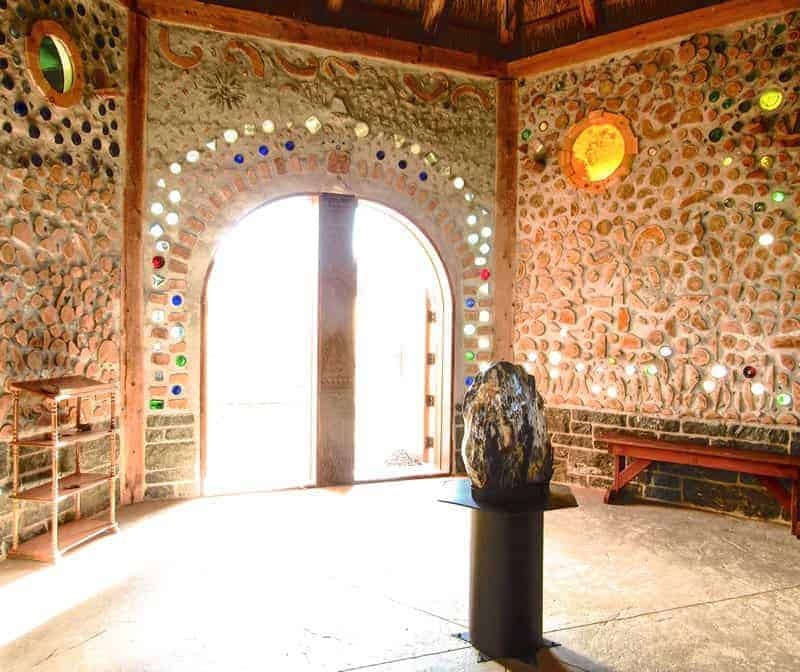 Kinstone has many stone features as well as interesting, artful structures for you to experience. Some of the major features are listed here, however, there are many more to discover as you wander in wonder. Kinstone Circle is the largest of three stone circles at Kinstone. 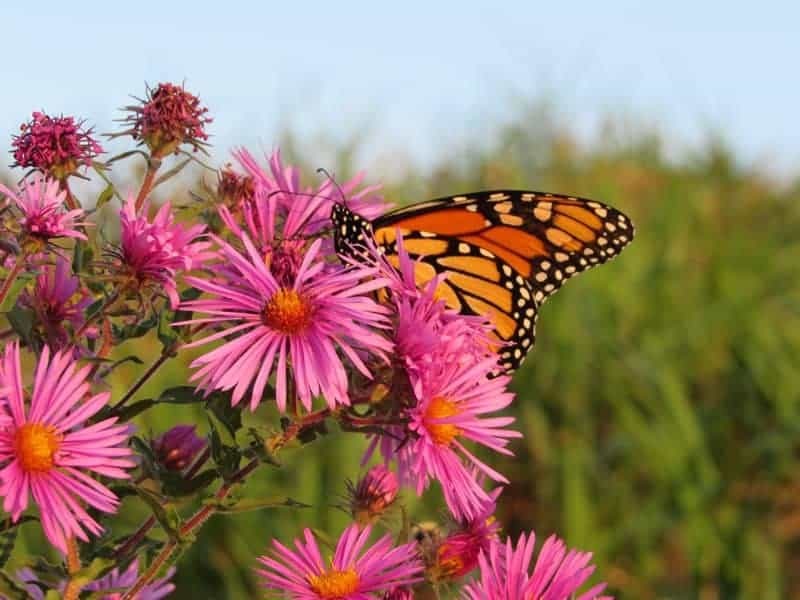 It was designed and raised by Kristine Beck in 2011 with the help of Ivan McBeth and a crew with a crane, backhoe, skidsteer, slings, levels, shovels and rakes. It is a circle of megaliths measuring 81.6 feet in diameter (30 megalithic yards, 1 megalithic yard = 2.72 feet or 82.96 cm). There are nineteen (19) standing stones in the ring that forms the circle. There are nineteen (19) smaller boulders that form an inner ring of sitting stones. There are three stones in the center of the circle. Nineteen is an auspicious number in sacred geometry; it symbolizes the spiritual nature of a place. 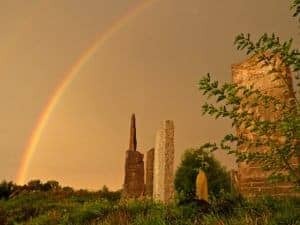 Kinstone Circle is a sacred space that is dedicated to family, relationships and interconnections with generations that have gone before us and those that will come after us. 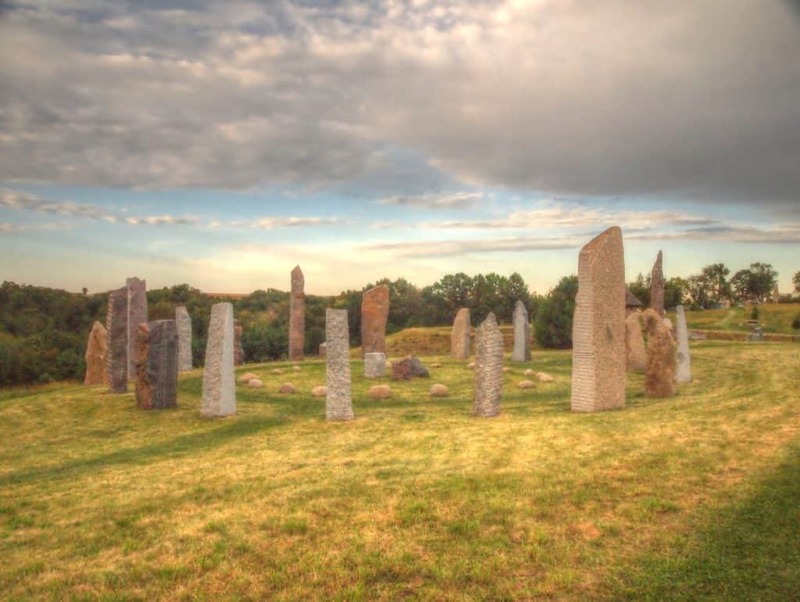 This large stone circle has been referred to as the largest privately owned stone circle in the world. This may or may not be a true statement, but the circle is pretty magnificent! The stones in the circle are a mix of Carnelian, Charcoal, Rockville White, Rockville Beige, Autumn Brown, Mesabi Black, and Rainbow granite – as named by Coldspring Granite Company, Coldspring, MN. Four stones mark the cardinal directions, North, South, East, and West. 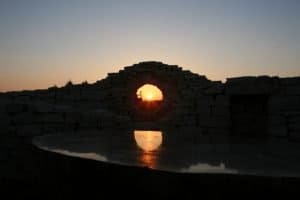 Two stones frame the Summer Solstice Sunrise and four frame the Winter Solstice Sunrise. Others represent other alignments. Ten of the stones represent Kristine and her siblings. The inner circle of boulders, called the Sitting Stones, offer a place for those that wish to sit awhile in the Circle. The three center stones, called the Trinity, represent the Source. We are all part of the Source and Kinstone Circle is a monument to our connections. Eternity, Beauty, and Illumination are the three center stones in Kinstone Circle. They were originally called Wavy 2 (Rockville White granite), Autumn Brown 1 (Autumn Brown granite), and Ke-Mesabi (Mesabi Black granite). 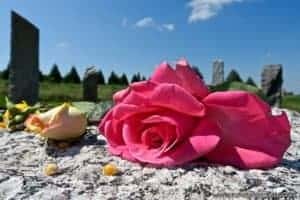 It is an interesting fact that these stones, which seem to be only about three to four feet tall, are really over 14 feet, 12 feet, and 7 feet tall respectively. The majority of these stones is buried in the earth. This was a design decision that was unexpected and unplanned but that turned out perfectly! These stones were originally planned to stand tall like the other stones in the circle. After seeing the circle nearly complete, Kristine decided she would not want to stand tall stones in the center that would obscure the view from one side of the circle to the other. Ivan McBeth suggested that we set them in the earth very deep to get them well below eye level. Just like an iceberg of which only the tip is visible; so it is with these special stones – their real mass and power are below the surface. Metaphorically, the most powerful things of this world are invisible. These three have come to symbolize that old saying “as above, so below”. These stones are mirror images of the stones in the outer ring. Construction of the Kinstone chapel, named The Chapel of Creation, was started in July 2012 and completed in October 2013. Over 110 people helped create it over that 18-month timeframe. It is built using cordwood construction, a natural building technique well-suited to this Wisconsin climate. The chapel has a thatched roof made with Phragmites australis, a water reed harvested from the Mississippi River less than 10 miles from Kinstone. The colorful bottles in the walls depict portions of The Canticle of Creation by Saint Francis of Assisi. A large piece of petrified wood graces the center and is a grounding stone for the Chapel and for all who visit. This is a sacred space designed for quiet reflection, prayer, meditation, and contemplation. Cordwood and thatch were suggested as building methods by Wayne Weiseman. The design of nature motifs in the walls was inspired by Kaitlyn O’Connor and developed by Kristine Beck based on the poem by St. Francis of Assisi. Jarad Barkeim did the stonemasonry work, thatch harvesting, much of the cordwood work and coordination of volunteers. Richard Flatau taught us how to build with cordwood and he put in the very first and the very last piece of cordwood in the Chapel. Richard Kuisle supported every effort that was undertaken on this building; he also mixed much of the mortar and prepped many of the logs. Jim Kampa Construction built the frame.Kenny Frie did the custom metal work. William Cahill thatched the roof. Chris Hostetler built the doors. Greg Zahn designed the stained glass windows with a little input from Kristine Beck. Dennis Beck made the stained glass windows. Lyon Smith designed and carved the wood carving between the doors. Bill Cohea gave the center stone to Kinstone as a gift. 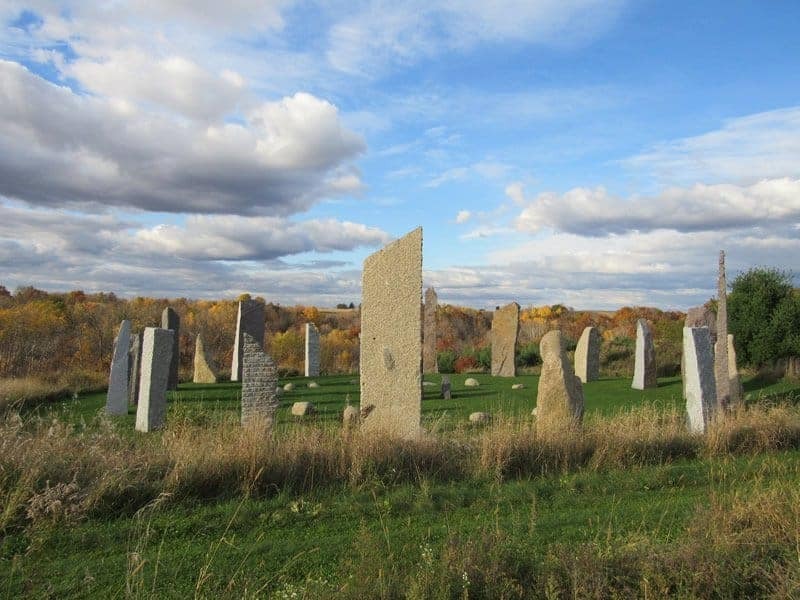 The Kinstone Labyrinth was designed by Kristine Beck in 2011 based on the 7-circuit, classical form. It was excavated on steep land which resulted in 5 erosion control terraces that step up-hill giving it the distinct feeling of an outdoor amphitheater. Created with the help of 26 family and friends on Saturday, September 24, 2011; it took just 6 hours to complete the laying of stone lines and paths. The stone lines are made with assorted rounded river rocks and the paths are a mix of champagne granite gravel (70%) and caramel quartzite gravel (30%). When walking this labyrinth the rhythmic crunch of feet on gravel brings to mind the sound of water lapping a pebbled beach or the steady beating of the heart. For those wondering exactly what a labyrinth is – here is a definition: a labyrinth is a meandering path, often unicursal, with a singular path leading to a center. Click the Learn More link below for additional information. Labyrinths are an ancient archetype dating back 5,000 years or more, used symbolically, as a walking meditation or a site for rituals and ceremony, among other things. Labyrinths are tools for personal, psychological and spiritual transformation, and are also thought to enhance right-brain activity. 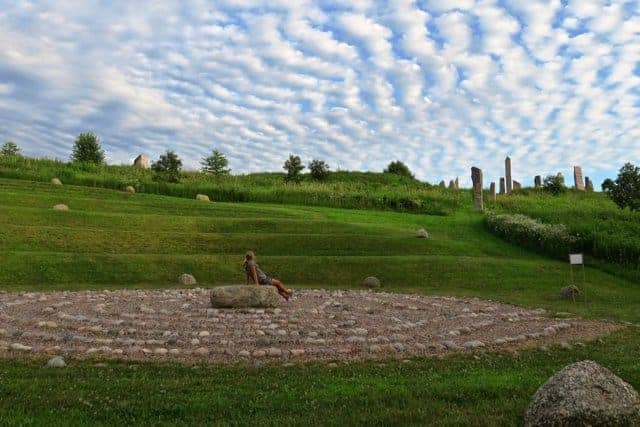 The Kinstone Labyrinth, like all labyrinths, evokes metaphor, sacred geometry, spiritual pilgrimage, religious practice, mindfulness, environmental art, and community building. A dolmen is a type of single-chamber megalithic structure, usually consisting of two or more vertical megaliths supporting a large, flat, horizontal capstone. The Kinstone Dolmen has four upright stones and a 13-ton capstone. There are 5 smaller boulders surrounding it as guardian stones. Historically, many dolmens served as tombs. No one is buried in the dolmen at Kinstone (yet! ); however, it has been consecrated to the remembrance of our ancestors and all those who have come and gone before us. 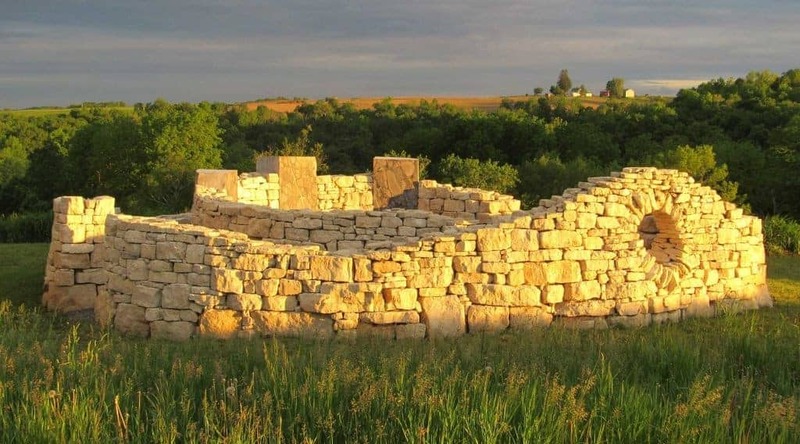 The Kinstone Dolmen was designed and built by Kristine Beck in 2012. She was notably influenced by Poulnabrone Dolmen in County Clare, Ireland, which she visited multiple times. 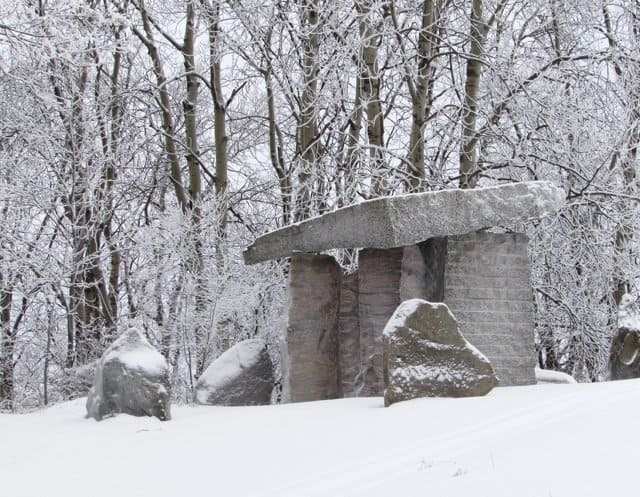 The Kinstone Dolmen is a sacred space dedicated to Remembrance. 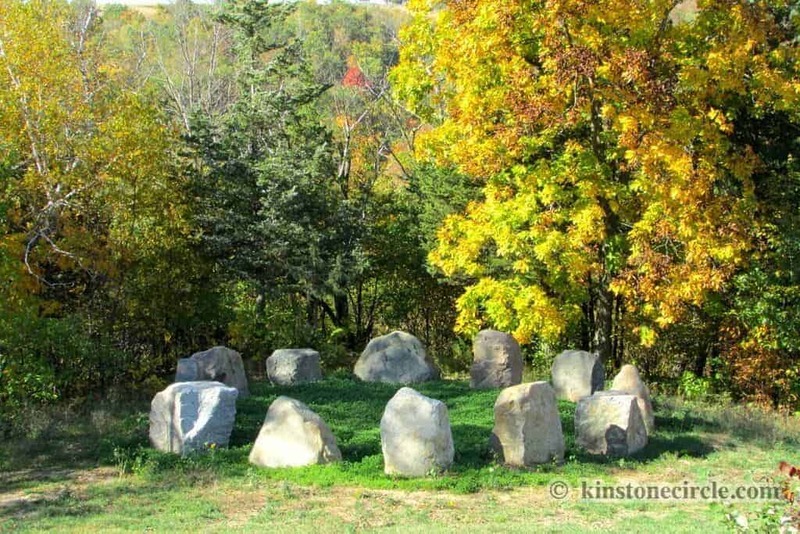 The Circle of Mystery is a smaller stone circle designed and created by Kristine Beck in 2012. It has 12 stones that are mostly natural boulders. One of the stones has a natural question mark emblazoned on its face. The interior of the circle was seeded with clover and this has grown to be a lovely green space with many four-leaf clovers already discovered! This circle is an intimate, contemplative space where you can spend time pondering the questions of life and figuring out ways to express your thoughts and insights. The Three Witnesses is a dry-stack and megalith sculpture designed by Thea Alvin with input from Kristine Beck. It was created by 12 people during a 10-day Dry-Stack Wall Building Workshop in October, 2014. The walls are built with limestone from the Bork Quarry on County Road M just about a mile from Kinstone. 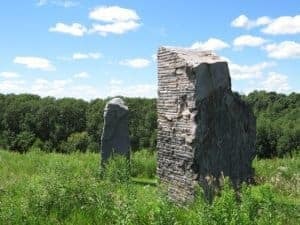 The megaliths in the structure are tillite and were all cut from a single, large, erratic boulder found in the Coldspring granite quarry at Rockville, MN. There is no mortar in the structure, including in the round opening called the Equinox Window through which the rising sun shines on Equinox, both spring and fall. It is critical that no one climbs on, pulls on, or touches the stones that are part of these walls. Please respect this space by viewing it with your eyes only. Thank you!! The structure was begun on September 24, 2014. 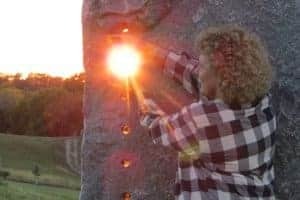 This was just a couple of days past the Autumnal Equinox, so Kristine took advantage of being able to view the position of the sun at sunrise relative to the center Witness in the walls. The center table and three megaliths were set first. The center table is polished which gives it a lovely reflective surface and allows for some amazing photographic opportunities. It often reflects the sunrise and clouds just like a lake would! There is a 4 foot deep, 4 foot wide trench under the walls that is filled with gravel. This “rubble trench” foundation is critical for the structure to withstand the frosts of winter in this climate. The walls were built from October 1 through October 10. Thea Alvin created the round Equinox Window by using a two-part circular form around which she set flat stones as if constructing an arch. The form was removed and the stones stay in place through the sheer force of gravity. She did it well as the window is centered on the line from Equinox sunrise to the center Witness. It turned out beautifully! 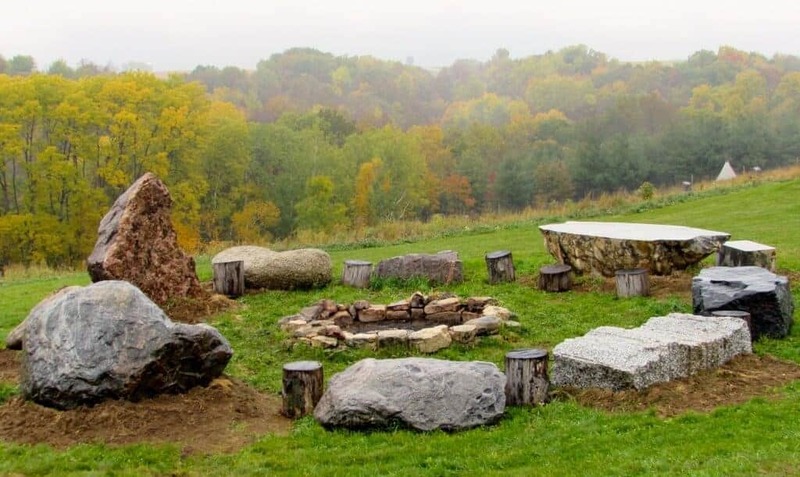 Stargazer Circle is an egg-shaped or elliptical stone circle that surrounds the fire pit. It was created by Kristine Beck in 2011 and then modified by her in 2014. There are nine (9) large stones in the ring that forms the circle. There is a limestone-lined fire pit in the center of the circle. The Stargazer Circle gets its name from two particular stones within it that are shaped a bit like natural recliners. They each make amazingly comfortable places to lie down and gaze at the stars (or the clouds, or the sky in general). As it turns out, many of the stones in this circle allow for wonderful, relaxed, reclined stargazing. Stargazer Circle. Photo by: Kristine Beck. There are many standing stones at Kinstone. Another word for a large upright stone, typically raised to standing by humans, is “menhir”. 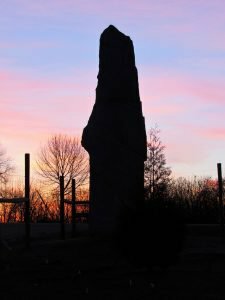 The tallest menhir at Kinstone is “Venus”; she stands at the east corner of the property and is 31.5 feet long, 8 feet of that are buried in the ground. The heaviest menhir at Kinstone is “Atlas”; he stands with Lancelot between the pond and the Chapel and weighs 35 tons! You can find over 185 boulders and menhirs that were brought to Kinstone by Kristine Beck since October, 2011. Lancelot (left) and Atlas (right). Photo by: Kristine Beck. In megalithic places around the world, the organization of the stones suggests a symbolic geometry that integrates life, death, water, the sun, moon, planets and stars. Seasonal alignments are found in several places around Kinstone. We celebrate the seasons by acknowledging and observing the continual dance between the Sun, the Earth, and Polaris. Alignments with stones in the large stone circle mark cardinal directions, true North, and the arrival of Summer Solstice and Winter Solstice. 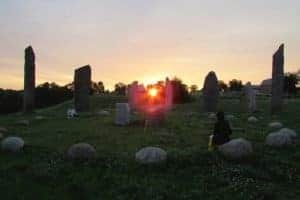 Summer Solstice sunset is marked by an alignment just created in 2018 with the RPK Memorial Stone and the Harp Stone. Through an alignment in The Three Witnesses sculpture, we witness Vernal and Autumnal Equinox sunrise. At sunset on Equinox, we see an alignment with Lancelot and Atlas. In all cases, the alignments are only visible when the sun is bright on the horizon at the appropriate hour (either sunrise or sunset, depending). Please join us on these special seasonal days – at sunrise or sunset as the case may be. Check the Kinstone Calendar to get details about our seasonal alignment events and other events that may be of interest! Early risers get to see some pretty special scenes when the skies are clear! Don’t go back to sleep!